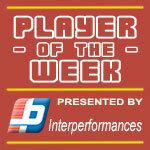 American Power forward John Fields (205-F/C-88) had a great game in the last round for Singapore S., receiving a Interperformances Player of the Week award for round 4. The 30-year old player was the main contributor (32 points, nine rebounds and seven assists) to his team's victory, helping them to beat Macau (#4, 3-2) 98-88. The game was between two of the league's top four teams. Singapore S. is placed at 3rd position in ASEAN League. They would have been even better if they hadn't lost that single game earlier this season. Singapore S. will need more victories to improve their 3-1 record. Fields turned to be Singapore S.'s top player in his first season with the team. Former University of Tennessee star has very solid stats this year. Fields is in league's top in points (6th best: 23.3ppg), rebounds (4th best: 10.8rpg) and averages impressive 1.3bpg and 67.2% FGP. 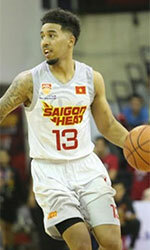 The second best player in last round's games was 26-year old American Mikh McKinney (184-G-92) of Macau. 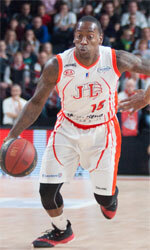 McKinney had a very good evening with 35 points, 5 rebounds and 7 assists. Of course Macau cruised to a 117-110 relatively comfortable win over slightly lower-ranked CLS Knights (#5, 1-2). Despite this victory Macau slide down in the standings to 4th position. His team's 3-2 record is not bad at all. McKinney is a newcomer at Macau, but is already one of team's top players. He belongs to the best scorers in the league with 26.0ppg (#2). His other stats are also decent: 5.3rpg and 6.8apg. Third on the list of top players last round was American Will Artino (211-C/F-92) of league's top team Formosa D.. Artino scored 29 points and grabbed twelve rebounds (!!!). He was a key player of Formosa D., leading his team to a 86-85 win against #2 ranked Saigon H. in a game of the week. Formosa D. started extremely well this year. They recorded 3 victories without losing a single game. Artino turns to be one of the very best players in the league while he is also a leader of the top team having his eyes on the championship title. Artino has a great season in ASEAN League. After only 4 games, he made it on the list of the league's leaders in points with 21.3ppg (9th best) and rebounds with 11.0rpg (3rd best). The intense semifinals matchup between the BTN CLS Knights Indonesia and Mono Vampire Basketball Club certainly lived up to the billing. After the dust settled, it was the fourth-seed Knights who came out with an 86-77 victory, Sunday night at GOR Kertajaya in Surabaya. Maxie Esho (206-F/C-91, college: Massachusetts, agency: Two Points) laid the groundwork with 21 points, seven rebounds, four assists, and two steals. But it was the brilliant play of two locals that placed Indonesia just one win away from entering the ABL Finals. Brandon Jawato poured in 18 points, including 8-for-8 from the free throw line and Arif Hidayat (184-PG-91) had a sensational game of 11 points off the bench. The headstrong guard was a burst of energy, going 4-for-4 from the field while adding, six assists and three steals. Jawato and Hidayat were the catalysts of a 17-2 run to close out the third period that gave the Knights a 63-48 cushion. The duo conspired for 15 points in the quarter's last four and a half minutes that changed the momentum of the contest. The game-changing run was punctuated by a dunk from Esho to close out the third. After Sandy Kurniawan's 3-pointer gave Indonesia a 19-point lead with seven minutes remaining, the Knights were ready to cruise to a dominant win. However, the Mono Vampire proved to be resilient and persevering, just as they have shown in the regular season when they pushed their way to the eighth-seed. The score read 81-63 with three minutes left, but the Thailand squad went on a 10-0 run, highlighted by back-to-back triples from Chitchai Ananti (194-G/F-90). Tempers flared in the final minute as Jawato and Nopporn Saengtong (189-PF-83) figured in a scuffle while going down the court. The two were ejected after getting slapped with a disqualifying foul each. The altercation was a product of back-and-forth physical play from the two proud teams in playoff action. Even though Mono Vampire made a significant run in the closing moments, the Knights had enough cushion. A free throw by Esho and a layup from Wei Wong Long put the final nail on the coffin, giving the home team an 11-point lead with 17 ticks left on the clock. Romeo Travis (198-PF-84, college: Akron) had a double-double of 16 points and 13 rebounds for Mono while Freddie Lish provided 15 points off the bench. Veteran forward Tyler Lamb (196-G-91, college: LBSU) returned to the lineup after suffering a hamstring injury and he tallied nine points. Mono was missing the production of Mike Singletary. He did have 12 rebounds and six dimes but the team's leading scorer only mustered nine points on a woeful 2-for-10 shooting clip. The two teams battled in a highly-physical matchup that resulted into a combined 40 attempts from the line. In the end, however, it was the Knights' 10-for-27 shooting from beyond the arc and the 20 assists that gave them the win. Mono Vampire won the rebounding battle 47-38 but their 16 turnovers did not help their cause. Game 2 is set this Wednesday, April 24, at Stadium 29, in Nonthaburi, Thailand. The Knights are hopeful for a ticket to the finals while Mono will be looking to extend the series.